Aseptic Packaging Market Size was valued more than USD 36 billion in 2016 and the industry will grow at a CAGR of over 9.9% up to 2024. Increasing demand for disposable instruments in the healthcare industry is expected to increase the demand for vials and prefilled syringes & ampoules, which will positively affect the aseptic packaging market over the projected time frame. Aseptic packaging helps the product to stay stable for long periods and its technology is very different from conventional food processing techniques. Moreover, shifting focus toward processed and packaged food increases the demand for cartons, propelling the growth of market over the forecast period. Evolving consumer preferences in favor of packaged food and increasing acceptance of various kinds of beverages will drive the market over the forecast timespan. Moreover, increasing applications of aseptic packaging in food, beverage, and dairy industries as it prevents the deterioration of products and increases the shelf-life will in turn positively affect the market. This is primarily due to its excellent properties such as resistance to physical and chemical deterioration and resistance to high temperature. These packages are treated in such a manner that it can withstand temperatures up to about 127°C for low-acid products and 100°C for high-acid products. The primary restraint for this market is the research & development cost and high initial investment cost owing to the cost of installing new packaging equipment and innovative packaging technology. The rise in the raw material cost and stringent environmental regulations across different regions are challenging the growth of this market. 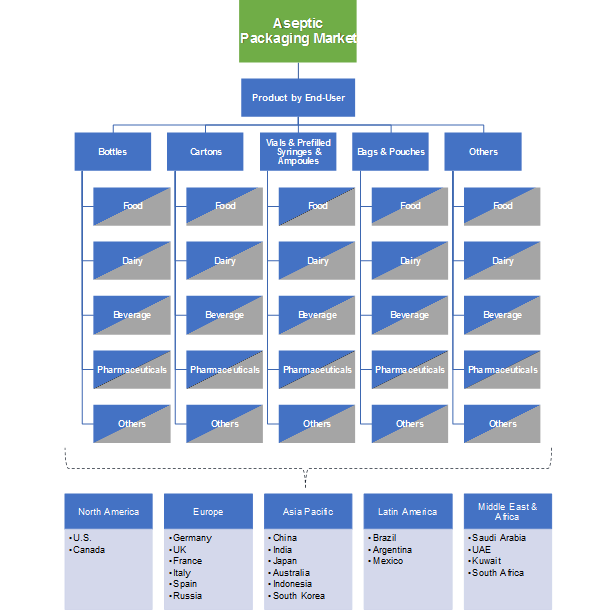 Aseptic packaging market has been segmented by product into bottles, cartons, vials, prefilled syringes & ampoules, bags & pouches, and others. Amongst these, the market size of cartons attained the highest market share with a CAGR close to 9% owing to widespread applications in beverage and dairy industries. Cartons increase the product’s shelf life and prevent products from deterioration for a longer period. Furthermore, they find major applications in the dairy industry as they increase the quality of the product for a longer time span. In addition to this, it changes consumer preferences on selecting such products over traditionally packed products, positively impacting the market. Based on end-user, the aseptic packaging market has been classified into food, dairy, beverage, pharmaceutical, and others. 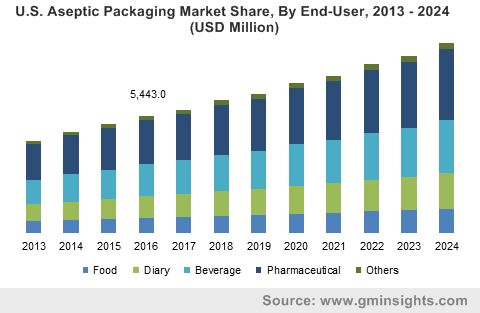 Amongst these, food industry market size attained the highest market share with a CAGR close to 8% owing to increasing applications of aseptic packaging in product forms of cups, trays, bags, pouches, etc., across the globe. Applications in the food industry, especially in emerging economies, are expected to increase over the forecast period owing to increasing acceptance of ready-to-eat meals, processed food, packaged food, etc. Asia Pacific is primarily led by China and India as they dominated the aseptic packaging market share in 2016. The regional growth was mainly driven by growth in food, beverage, and dairy industries and the increasing usage of processed food and beverages in emerging economies of the region. Moreover, the market is expected to increase in countries, such as Indonesia, Australia, and others, over the forecast period due to changes in consumer preferences. North America is exhibiting a significant growth across the globe over the forecast timeframe owing to regional investments on capital-intensive projects and the availability of technical equipment in the U.S. and Canada. The region is dominated by the beverage industry owing to high beverage consumption. Moreover, the increasing demand for packaged food owing to a shift in consumers’ choices for convenience food, reluctance in cooking fresh food daily, etc., will increase the growth of the market over the forecast period. Latin America witnesses an increasing growth owing to the expansion of beverage and food industry in Brazil and rising living standards coupled with the increasing demand for packaged food. Additionally, the Middle East & Africa (MEA) market share shall witness promising gains owing to increasing investments in the food processing industry. The global aseptic packaging market share was competitive in 2016. Major companies contributing to the global share include Amcor Limited, DuPont., Tetra Laval International S.A, Krones AG, Scholle IPN, Lamican International Oy, Ecolean AB, Sealed Air, Goglio S.P.A, Agropur Cooperative, IPI, Printpack, and others. Key industry players are investing heavily in the R&D and its production facilities to expand its geographical presence and attain a competitive advantage in the business. Furthermore, key players follow innovations owing to the changing demand of consumers in terms of performance, quality, and appearance, etc., to strengthen their market position. Aseptic packaging is derived from both natural and synthetic raw materials. The global market is determined to be extremely attractive as these packaging products have extensive applications in various end-user industries such as food, beverage, and pharmaceutical, among others. Extensive research activities will further reduce their processing prices and make it feasible for all the kinds of consumers. Rising needs for packaged food and increasing consumption of beverages will lead to an increase in the usage of aseptic packaging over the forecast timeframe. Furthermore, its use in emerging economies is expected to increase owing to the increasing population, which will lead to changes in consumer choices toward such products, in turn augmenting the market over the forecast period.